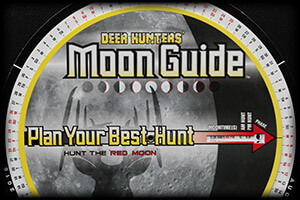 Understanding the connection between deer movement and the moon, and why the MoonGuide works so well predicting big buck activity! Man has long understood the effects of the gravitational pull of the moon, even beyond the obvious like the earth’s daily rising and falling ocean tides. This gravitational force also has a profound effect on living creatures. Deer hunters have long looked for a connection between the moon and deer activity. Initially, they looked for a connection between the various phases of the moon and deer movement. However, this connection never seemed to pan out for hunters and, despite continued efforts by some, was ultimately refuted by researchers. In 1994, outdoor writer, Jeff Murray, penned the book, Moonstruck. In his book, the late Murray, asserted that it was not, in fact, moon phases that affected/predicted deer activity but, rather, it was the position of the moon. When you think about it, this makes more sense as the position of the moon better predicts the strength of the gravitational pull of the moon. Murray’s theory was based on various works including John Alden Knight’s Moon Up Moon Down, a book about his solunar tables. But, it was Murray who helped to isolate those times during the moon’s elliptical orbit around the earth that result in maximum gravitational pull. Known in astronomical circles as superior transit times and inferior transit times, this happens twice per orbit and is, essentially when the moon is directly overhead or underfoot. Predicting daylight activity for giant whitetails! 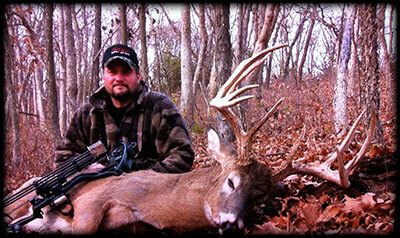 What’s the secret to killing mature bucks consistently? 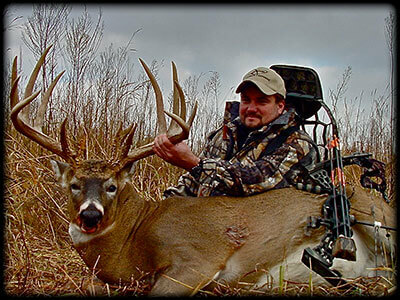 How do some guys seem to score on bigger than average bucks year after year when other hunters struggle just to see a shooter? There are so many variables that can affect a hunter’s success it would be tough for a couple guys to agree on one or even two of these key factors. I’m willing to bet, the more guys you ask, the more different answers you will get! Forget about all of that for a minute. Forget everything you’ve read, everything you’ve watched on TV and every tip you’ve seen on Facebook. Clear your mind and ask yourself this simple question: What is the single most important factor for me to kill a big deer this fall? I can imagine there’s probably a host of answers running through your mind right now, but the answer is simple: you can’t kill him if he’s not there. Let’s take that one step further and acknowledge that he must live there (and) he has to be moving during daylight for you to kill him. EVERY hunter that has ever killed a big buck had these 2 things in common, period! After 33 years of bowhunting I’ve learned a few things in the whitetail woods. Scout more than you hunt, play the wind, the first time in is the best time and quality products can make a difference between success and failure! There are just some pieces of equipment that you should not scrimp on! Quiet bows and treestands are a must without a doubt. Spend every penny you have to buy the best arrows possible. Shoot a broadhead that will NEVER fail. 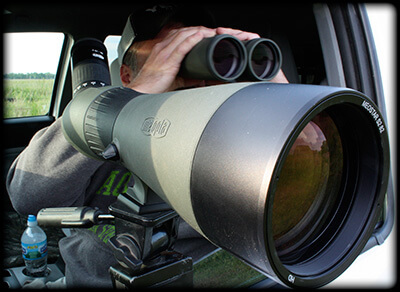 Last but not least, buy the best binoculars you can afford! Beating a mature bucks nose is what its all about! Show me a big whitetail that has survived to be 4, 5 or even 6 years old and I will show you an animal that has learned to play the wind to his advantage, he has to or he dies, plain and simple. By the time a monster buck has reached maturity he has become a survival expert and he trusts his nose above all other senses. I have based my entire strategy on hunting giant bucks around the wind because I know how important it is. If one thing changed my success ten fold, it was when I quit hunting the winds that were good for me and started hunting winds that were good for him! Illinois has been one of my favorite hunting destinations for the last 6 or 7 years, and I normally draw a bow and a gun tag, (non residents can shoot one buck with a bow and one with a gun) and with the gun opener this Friday I couldn’t wait to load the truck and head west. I managed to take my best Illinois buck to date in October this year with a bow, and hope my luck continues into the gun season. I hunt with a very close friend in Illinois that farms a few thousand acres of the fertile farm ground that borders the Illinois River in Schuyler county, just west of Springfield. Since it’s not too far out of the way, I usually make an annual stop in Peoria to see my friends at Lone Wolf Treestands when I’m in the area. Now, normally I’m not the type of guy that will try and push a product on someone, let alone talk about it on tv or write about it. But, after my visit with Jared Schlipf the owner of Lone Wolf, he showed me a couple new products that are definitely worth mentioning! Improve success ratios dramatically by "consulting" the moon before deciding on specific dates and strategies for your hunt. Free app, digital streaming to watch any episode, anytime, anywhere.